“There were no apparent risk factors. I had no family history of breast cancer, married early, had a baby whom I breastfed. Above all, I followed a healthy lifestyle. The only thing that could have led to my cancer could be environmental factors—exposure to pesticide residues through food and pollution,” narrated Niti, a young breast cancer survivor, at a meeting on non-communicable diseases held in Delhi on December 18, 2013. Arsh, who survived cancer at a young age of 19, had a similar tale to share. Both complained how difficult it was to get chemical-free food. A set of new studies presented at the Indian Cancer Congress, held in New Delhi from November 21-24, 2013, might fill the gap. These studies point to co-relation between pesticide toxicity and breast cancer. Scientists from the Mahavir Cancer Sansthan and Research Centre, Patna, reported that they found excess presence of oncoprotein (proteins that cause the transformation of normal cells into cancerous tumour cells) in those breast cancer patients who had higher amounts of pesticide residue in their blood and tissue. The samples were collected from patients visiting the hospital over a period of 10 years. It is known that chemicals such as DDT enter the body through the food chain and act as a synthetic hormone. Hormones play a significant role in the development of breast cancer. Pesticides and their metabolites lead to excess production of the oncoprotein called HER-2/neu which is encoded in a gene named ERBB2. The study, researchers said, indicates that “DDT may be one of the factors responsible for increased incidence of breast cancer among women in Bihar and may also be associated with the increased over-expression of HER-2/neu”. “Many studies have reported a possible relationship between DDT and breast cancer. An association is plausible and therefore such data are quite useful,” says Prakash C Gupta, director, Healis-Sekhseria Institute for Public Health, Mumbai. The research centre in Patna collected data on breast cancer from 38 districts in Bihar. Breast cancer was found to be remarkably high in women from Patna, Bhojpur, Muzaffarpur and Munger districts, which fall in the fertile Gangetic zone with supposedly higher use of pesticides in agricultural operations. 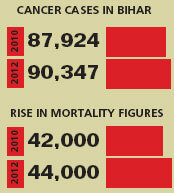 This data corroborates data collated by the Indian Council of Medical Research, which show that the number of cancer cases in Bihar is among the highest in the country. Cancer cases in the state increased from 87,924 in 2010 to 90,347 in 2012, while mortality figures increased from 42,000 to 44,000 during the same period. “Chemical carcinogenesis is a complex process and its effects can manifest over generations,” points out Manoj Sharma, professor, department of radiotherapy at the Maulana Azad Medical College. “Exposure to chemicals takes place at every stage of the agriculture chain—from farm to the dining table,” he says. Cancer as such is a multi-factor disease but exposure to toxic substances through food or the environment is a well-recognised risk factor. For several years now, a large number of cancer cases are being reported from the agriculture belt of Punjab where chemical use in agricultural operations is very high.